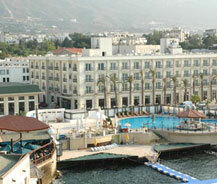 A hotel which is located at the heart of the coastal city of Girne is the Rocks Hotel and Casino. This is situated at the distance of 60 kms from the Ercan Airport and it is very near to Old Girne Harbor. The rooms in this hotel are decorated in a way such that it satisfies all its customer needs and the staffs present here also behaves in a very kind manner to satisfy the guests wish. The hotel engulfs 165 rooms and suites with either a Sea View or Mountain View as it is between the Mediterranean Sea and the Mountains. The scenery from the room is very elegant and it is very rare to have a view like this. In 155 rooms there are 12 suites which are luxurious and other 143 includes superior rooms, non-smoking rooms, inter connecting rooms and also there is rooms for disabled with necessary amenities and features in-built. There is also reception halls and seminar halls which is useful for any parties and business meetings respectively. All the rooms except luxury suites contains necessary amenities like air conditioning, heating, satellite TV, hair dryer, direct phone line, mini and maxi bars, showers in bathrooms and balcony. In the case of luxury suite it engulfs plasma TV, hydro therapy Jacuzzi bath. Other than this it includes all the necessary features of five star hotels and because of all these features many guests are regular to this hotel and you can also experience it in your holidays.